Dozens of protesters attempted on Sunday to storm the building of the administration of Iraq's southern governorate of Basra, after which the police officers opened fire at the demonstrators, the Sky News Arabia broadcaster reported. According to the Sky News Arabia, at least four people were injured in clashes between the police and protesters. On Saturday, the protesters tried to attack the building of the Karbala governorate's administration after which the Iraqi Interior Ministry ordered to enhance the security of government facilities. The units of the ministry have been instructed to deploy security cordons next to government buildings and in the areas marred by unrest. Despite the curfew imposed in the country, the protests continued on Sunday. Some banks in the country had to cease work out of concern for the safety of its employees, while the law enforcement officers have increased the security measures around the country's oil and gas facilities. 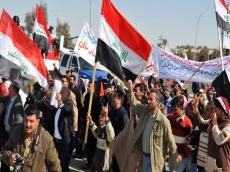 Protests against unemployment and a poor state of communal services sector began in Iraq's southern city of Basra about a week ago, escalating further after the death of one of the protesters. The Iraqi citizens, in particular, demand that the country's authorities put an end to the disruptions in the electricity and water supplies and call for the job creation.